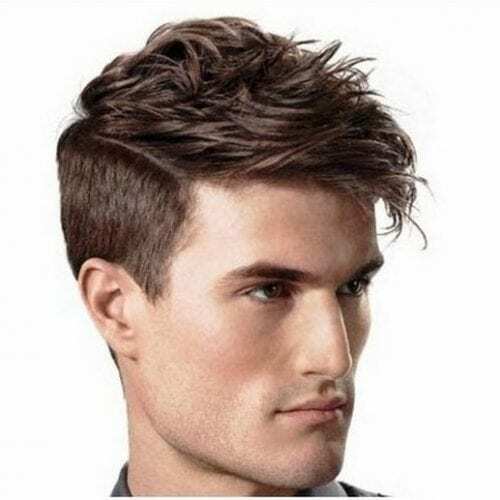 The umbrella term of “short sides long top hairstyles” represents haircuts that are incredibly versatile, with a number of options to make them completely your own. The hair on the top can be fashioned into an array of different textures, layers, colors, and styles to suit any facial shape. Since it is still short, these looks can be perfect for both professional and casual environments. Check out our choices below! 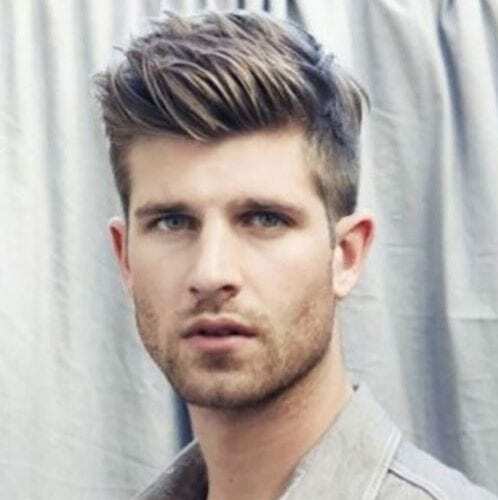 To achieve this look, all you need is medium-length hair on top and shortened hair on the sides. This medium-length hair should either be naturally straight, or it can be straightened using a flat iron. Moreover, you can give it a lift with a little gel or mousse. 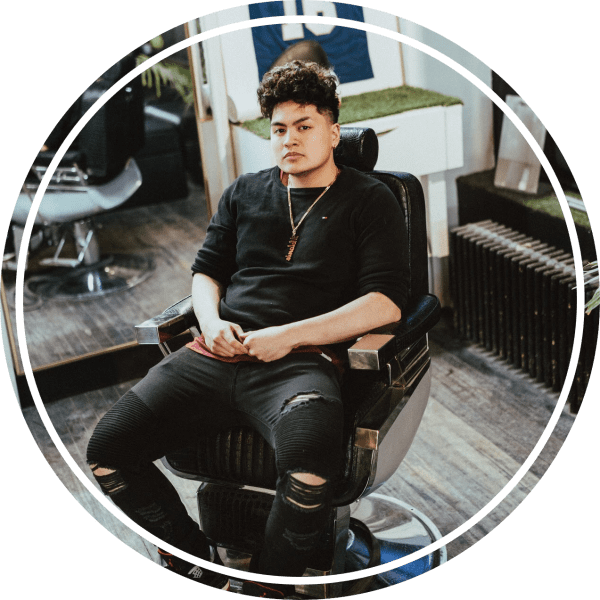 To get texture, volume, and a whole lot of character, let your long to medium-length curls run free on top of your head while keeping the sides tamed and short. This provides a handsome contrast that will serve to make you look stylish in absolutely anything you wear. Don’t shy away from the bowl cut. This style looks exceptional on those with defined facial features. To be more specific, you should use bangs in the front that taper gradually back to a shorter cut behind the head. At the same time, allow all of the hair to overhang a buzzed undercut for brilliant contrast. All you need for your long hair on top to give it a professional makeover is the addition of a little of gel. This style is versatile, letting you lay it as flat over your head as you’d like. Simply run gel through it and push it back to give it the desired texture. 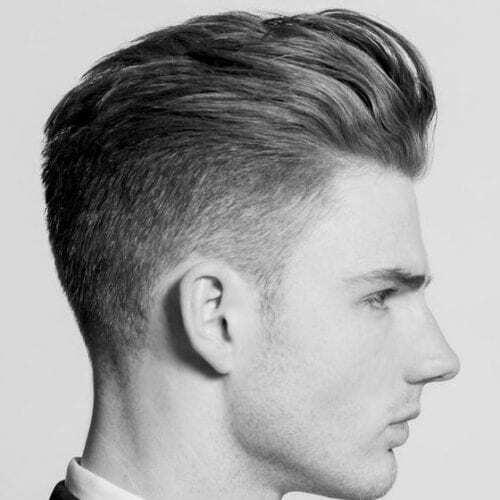 The side-parted pomp features a neatly gelled and styled pompadour haircut that has been slicked over to one side. Consequently, the pomp part of the hairstyle is very prominent and can even be buzzed in to give a sharper effect. Beneath the pomp is a subtle fade through the short sides. Bangs are an excellent way to let a face look more proportionate. No matter the length on top, you can get this look by allowing a little extra length to hang over your forehead. Cut the bangs into layers, a tapered angle, or leave them straight for a more edgy appeal. The casual side swept part is a nice look for those who want a more casual appearance. Your short sides play against the length of the hair on top, and all it takes to give your hair that side-swept look is a little gel and some hairspray and you are ready to go. 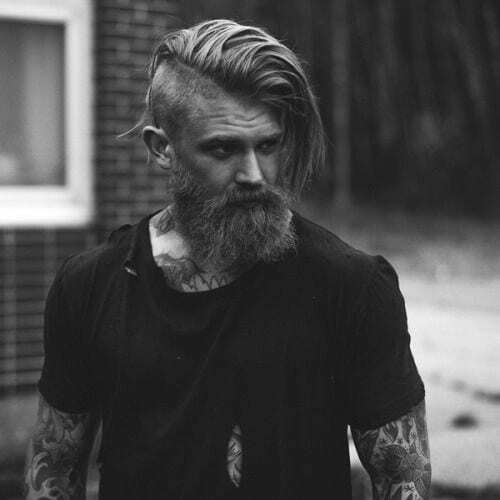 Undercut hairstyles have been gaining popularity in recent years, and they aren’t stopping now. Add some sharp contrast between long and short with buzzed sides and light, soft locks atop your head. As a result, the stark contrast between long and short is clear and dramatic. 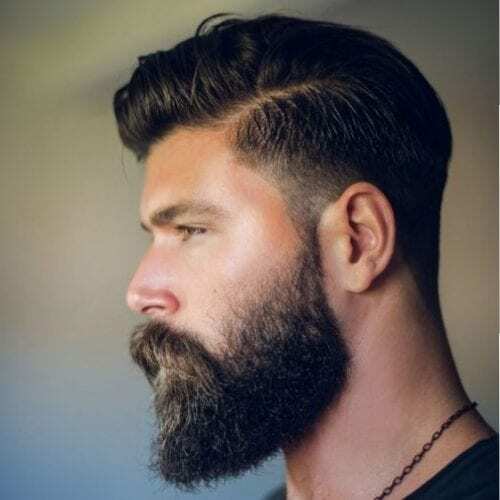 With longer strands of hair in the front and shorter ones in the back, you can create a beautiful pomp that cascades effortlessly down the top of your head. 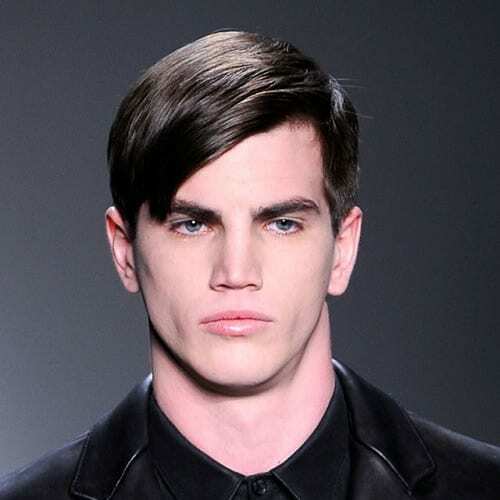 There is a bit of volume up front that flatters features as the pomp travels away from the face. 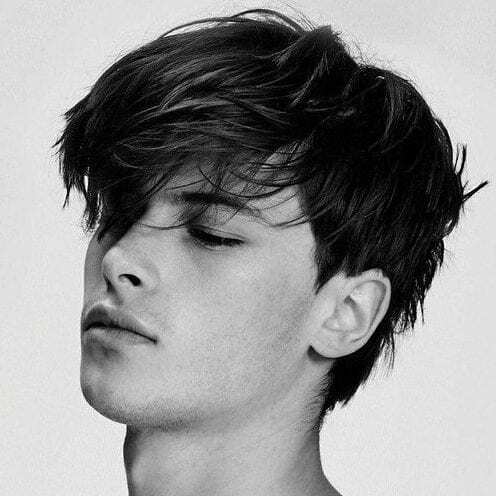 The brushed over style looks good with straight, wavy or curly hair. 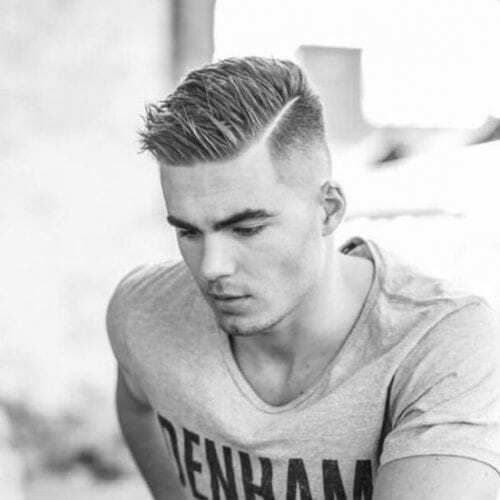 To achieve this look, simply take a comb with a bit of gel and bring all of the hair on one side of the head over to the other, using the gel to keep it in its place. 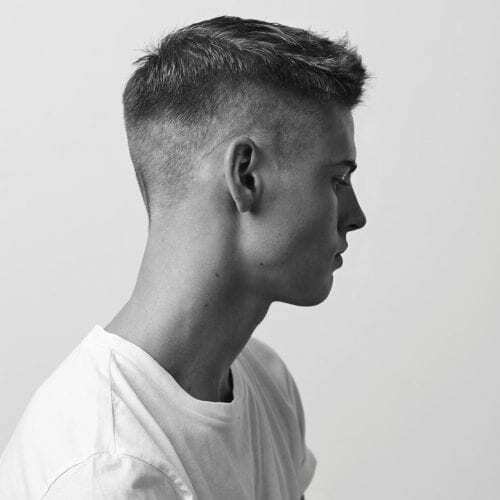 The clean-cut look is another disconnected undercut style that features short sides and a long top. The top has been gelled over to the back, although you can gel it to the side for a similar effect. Product keeps the hair in place for a tidy and professional appearance. The messy side part can be done with any type and texture of hair. Part it to the side without product; simply let your hair do what it wants. With a little gel, however, you can make it so that the hair parted features some texture to it. 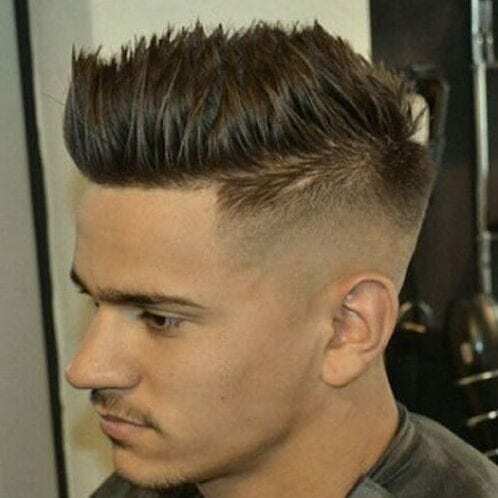 The unformed pomp displays a style similar to the traditional pompadour, except it has not been smoothly styled into a single shape. Instead, this pomp has a tousled look to it. Straighten the hair on top and then gel it into pieces. On the other hand, if you have naturally straight hair, let it do its thing. 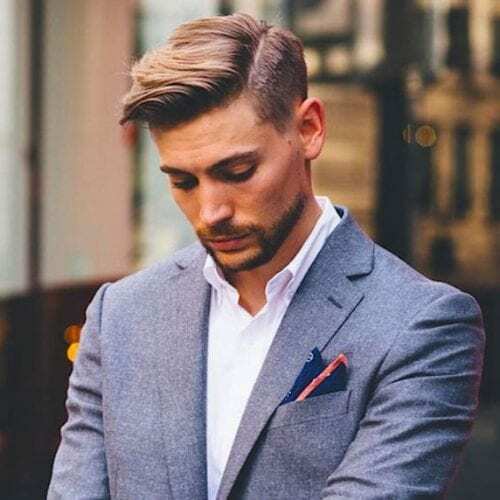 The flat pomp with a side part is just that: a pomp that sacrifices a little of its volume and lays flat across the head while being parted over to the side. Use gel to achieve this look. This adds a modern touch to a classic style of hair that is absolutely timeless. The heavily gelled and back-brushed look will give its wearer an air of hip style while also reaching back into fashions of old. It has been brushed back from the front and uses a lot of gel to achieve a look that is both textured and cleanly-cut all at once. 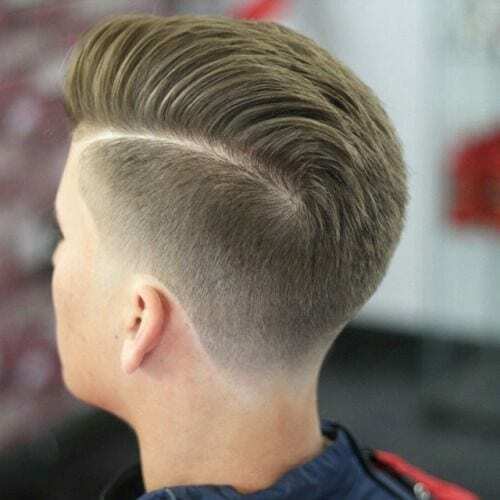 The angled pomp gives a contemporary twist to the pompadour that began decades ago. This hairstyle features a lot of volume and a little mousse. One side of the pomp has been pushed over at an angle to meet the other side of the hair and give it a distinct point. The sides of the head are shaved down a bit to add contrast to the top, which is a large, voluminous work of art. 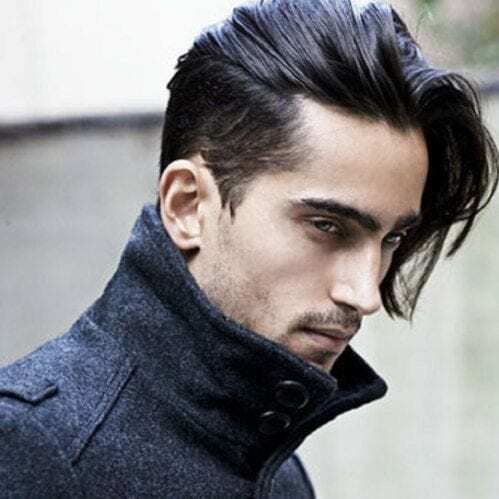 The hair is pushed back into a loose pomp, but its locks fall naturally into place as opposed to being held there by gel. Take a classic greaser hairstyle and give it a bit of a modern upgrade by messing it up. 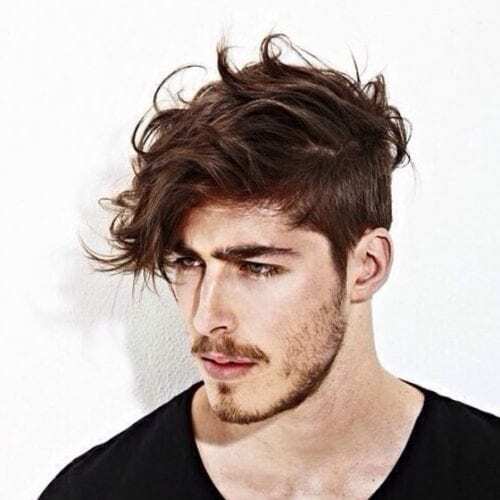 This hair style shows short sides and a long top, the latter being in different layers. It falls over the face to form that greaser look, but the lack of gel gives it the messy appeal. The faux hawk with tip is a great everyday style. It features a short back that gradually tapers up to the front of the head. At the front, it collides into a tip that stands tall over the rest of the hair and adds definite dimension to the look. Great for those with angular faces, the piecey but flat look features short sides that rest beneath long strands of straight hair. The hair has been cut into layers and lightly tousled with mousse to give it a textured effect. This hair is then brushed forward and serves as bangs. This hairstyle is modeled after some common military haircuts that we see everywhere. 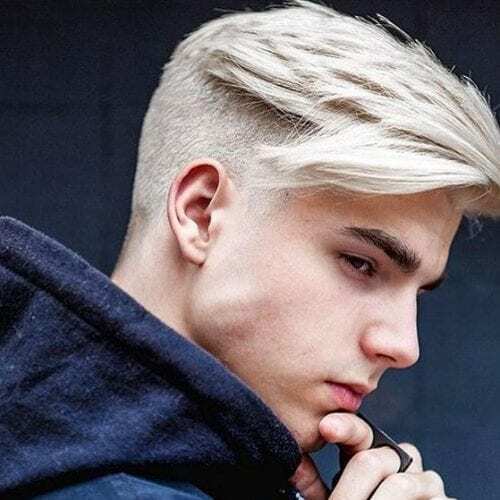 The difference is that, instead of the top of the hair being as short as military standards, the hair has been kept a few inches long to provide some contrast and shape to the closely shaved sides. 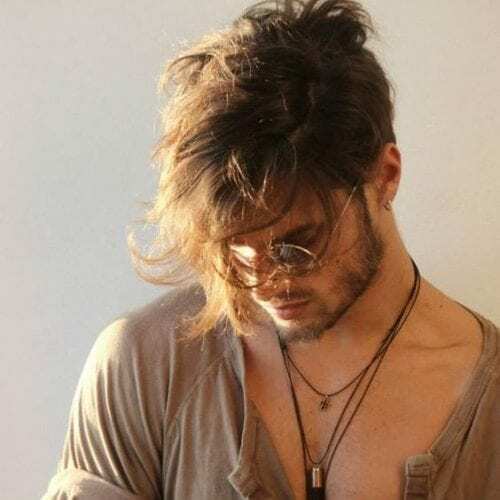 You may also want to consider the piecey bedhead for easier short sides long top hairstyles. All you have to do is climb out of bed and go. If you want a more styled look, you can always form the strands into pieces that stick out among the rest for an intentionally sleepy look. With pushed up bangs, what you are going for is short or shaved sides, a short back, and a long front. The hair from the back gets pushed forward into the front where the bangs are. Afterward, using gel, the bangs are pushed to stand almost upright. The classic faux hawk has short sides and a long top pushed into the shape of a mohawk. However, the sleepy faux hawk has no gel bringing it to a point. Hence, your natural hair falls free and does what it wishes like a bedhead style might. 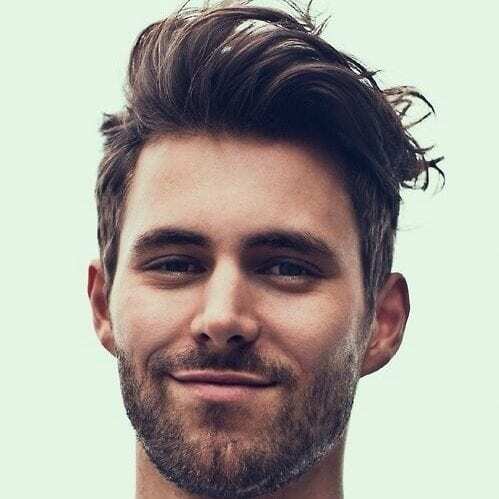 For you gents with thick hair that is full of volume, play up your natural hair by choosing to go with a voluminous top. 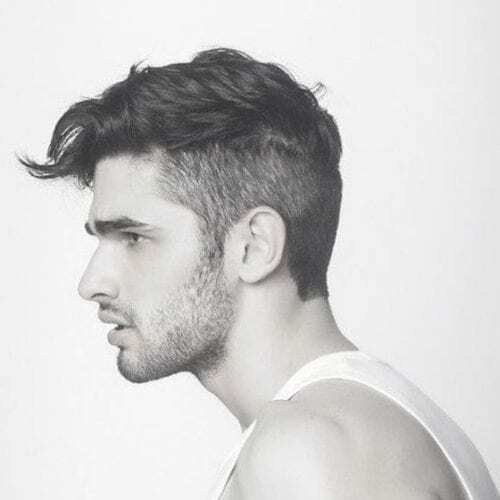 This features sides cut short and thick, long hair up top that can be styled a number of ways. 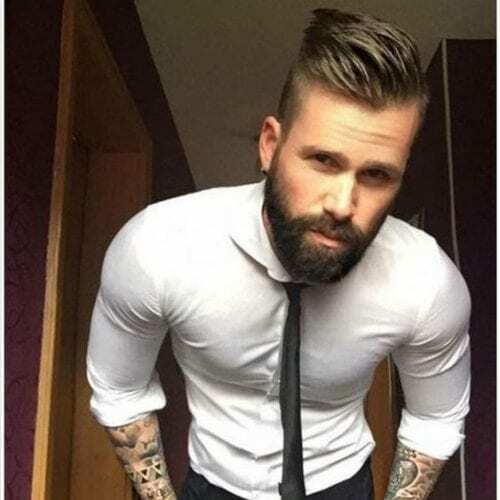 Pushing it into a loose pomp looks great. 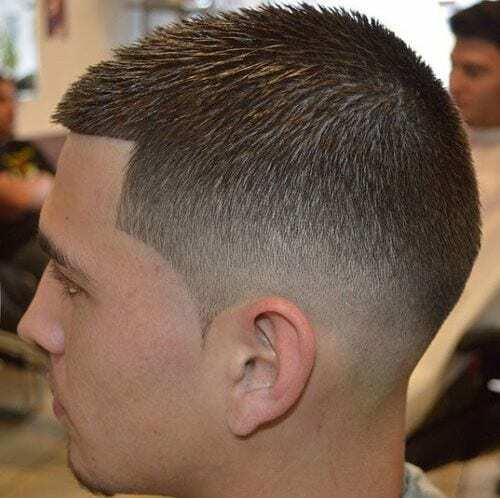 To be worn with either a buzzed part or a natural one, the gelled side part shows hair that has been parted to the side in one form or another and gelled down to lie mostly flat against the crown of the head. The more gel, the more textured the look. One of the most commonly worn and versatile looks is the faux hawk. It involves short sides and a long or medium-length top. The top of the hair is pushed together at a slight angle in order to give it a bit of a point, similar to a real mohawk. This faux hawk is similar to the classic style. The difference between them lies in the way that this faux hawk is not as uniform as its originator. This faux hawk uses mousse instead of gel to give it a bit of shape while also letting it retain the natural texture of your hair. The windblown hair style has a natural look to it. Without trying too hard, you can get this look with a little mousse or gel. 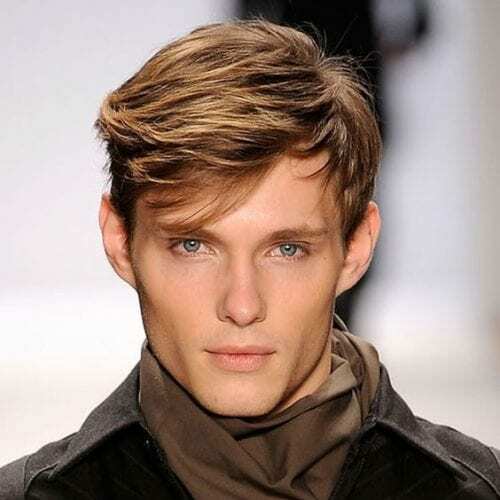 The hair is swept back and to the side a bit to give it a breezy appearance as if the wind has styled your hair for you. No matter what your hair type is, you can have a textured appearance and bangs to frame your face. All you have to do is cut your hair in layers or add gel. This hair style features a long top with bangs that can be cut in any number of ways to get the desired look. 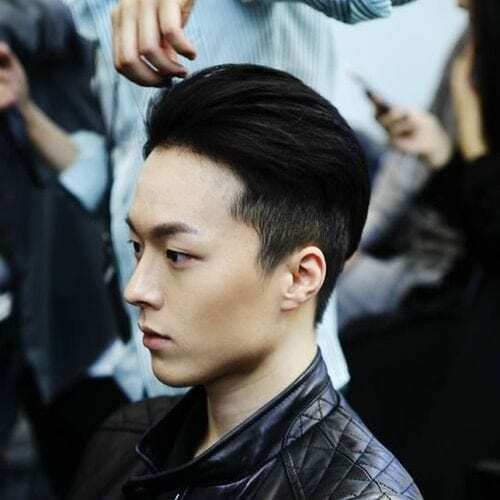 Similar to a faux hawk, the spiked up look has short hair on the sides with much more hair present on the top. The difference here is that instead of a point, the hair is spiked up in pieces using a strong hold gel. You can make these spikes as subtle or dramatic as you wish. A quiff is any style of hair that has been pushed back and away from the face, but the textured quiff keeps it from lying flat. Wearing this type of quiff gives you some dimension and volume and becomes just as much of a fashion statement as your outfit is. You can look dapper and professional while still being well suited for a night on the town with this look. It features a long top that has been pushed back like a quiff but gelled into place in the shape of a classic pompadour with textured pieces throughout it. Let the longer hair on the top of your head overtake some of the short hair beneath it with a dramatic part. 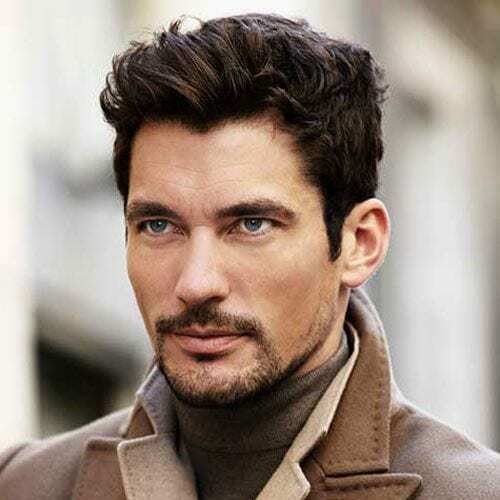 This look is achieved by parting your hair to one side and bringing most of the hair to a side, exposing most of one section while covering the other. One of the most versatile styles you can wear to any formal or informal event is a subtle faux hawk. This look features short sides that rise up to its longer top where the hair gets pushed together to form a slight faux hawk Therefore, you won’t overwhelm your face or attire. Here is another variation of the disconnected style. You can shave down the sides to almost nothing and allow the top to be loose and free. It looks great with wavy hair and those with loose curls. The back is longer and is brushed forward to reach the shorter locks at the top. 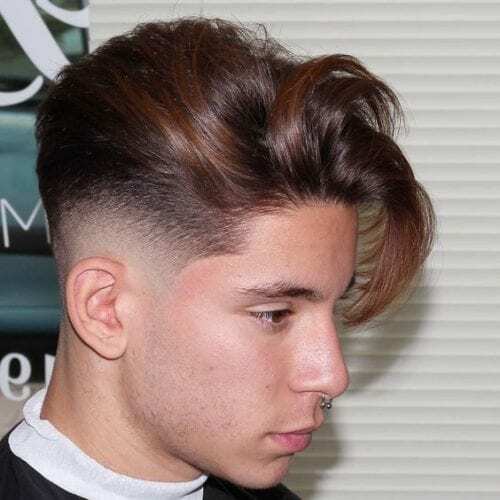 Similar to the wavy top, this flowy look gets its name from the way the quiff flows so smoothly across the crown of the head. It starts off piecey and short and gets longer as it goes, flowing effortlessly from one layer of hair to the other. Perhaps the easiest way to style your hair is by not styling it at all. The messy and untouched look is exactly what it sounds like. To obtain these results, there is no product needed. Trim the sides short, let the top grow and give it a little tousle with your hand in the morning before you step out the door. 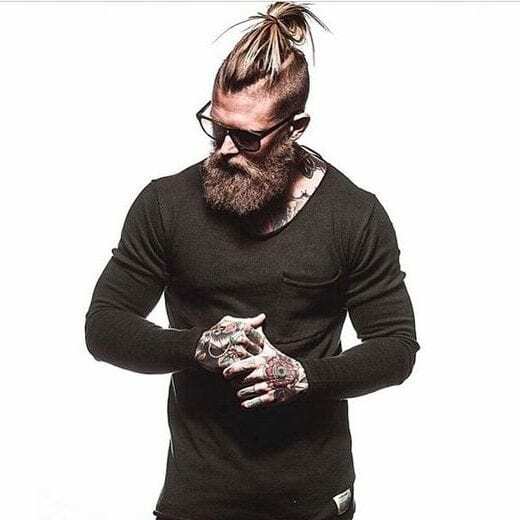 A striking combination of very long and very short intersects here with the prominent man bun and shaved sides look. Here, the sides are shaved away down to nearly nothing while the top is encouraged to grow long. 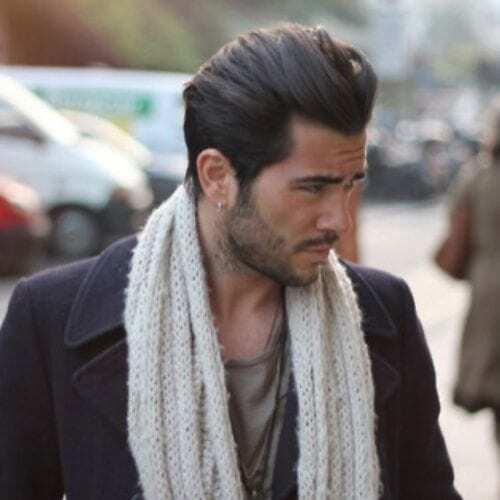 Tied into a messy bun at the top, the contrast between lengths and textures is enormous and handsome. 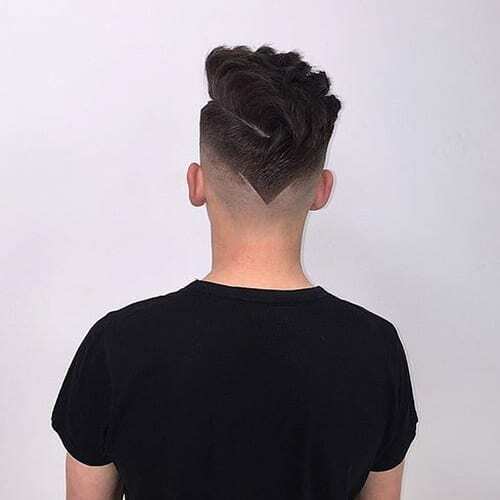 The side pomp with an edge is a look that consists of a typical pomp, but one that has been pushed off to one side or the other. On the remaining side, the short hair there has an edge cut into it to give a sharp indication of where the short hair ends and the long begins. 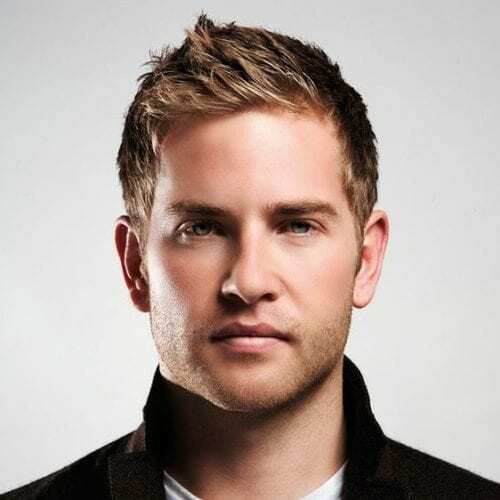 You can also try this hairstyle with very closely shaven sides and long, voluptuous hair on the top of the head. The hair can be worn flipped over one side or parted down the middle to give hidden depth and dimension when appropriate. Straight or wavy hair works best for the voluminous undercut. For a bold and daring way to bring some life to your hair, give it the platinum upgrade. It is eye-catching and alluring. Furthermore, coupled with the texture of the top of your hair, it provides a striking combination. The top is cut into layers and then styled with gel to achieve texture. Because the sides are almost completely shaved down, it leaves plenty of room for the long top to take over and swirl around your head. This style features a brushed-to-the-side look with gel to keep it in place and give it texture with a bit of a dip throughout. The wave is similar to a hair flip but it is better suited for straight hair. Flip one side of your long top over and let it cascade down the shaved sides of your head, the same way a wave moves as it curls and crashes. The look is better suited for hair with layers. Parted to the side, this look features a sizable amount of hair on the top of the head that is gelled over to form a small mound. The other side is somewhat long and tapers down to very little hair on either side of the head. Alternatively, this long-top look features shaved sides and a top that has been cut to accommodate a pompadour. Instead of gelling it completely back to give it that true pomp shape, it has been slightly gelled and a few pieces have been allowed to fall away free from the mold. With a bit of length on top, no matter how long, you can accent it with some designs cut into the shaved portion of your head. This one is fun because you can choose not only how long you want the top, but in most cases exactly what sort of ornate design you’d like on your sides. The simple man doesn’t ask for much. Basically, he doesn’t make a big fuss out of his hair and all he’s looking for is a practical hairstyle. 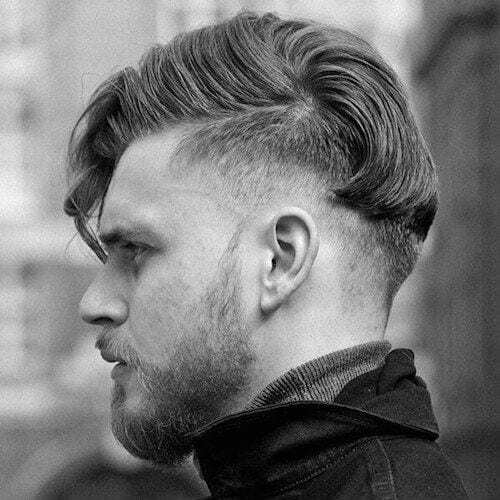 This style features length on top that gradually tapers down in a fade until there is nothing left, creating a neat and tidy look. 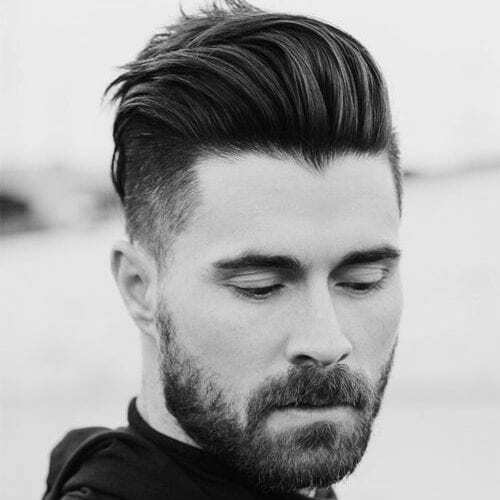 The layered pomp fade features two layers of thick hair, one of which eventually dissipates into nothing, thanks to the fade effect. 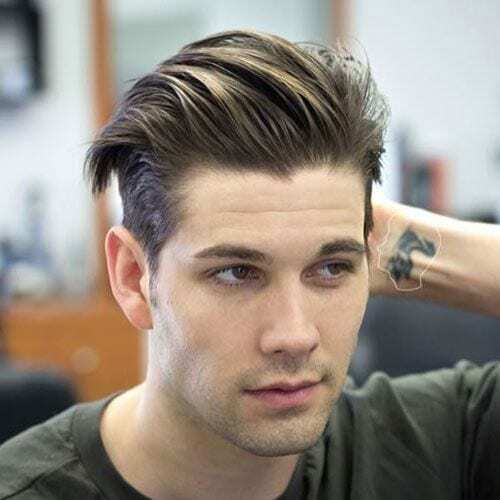 As a result, the top of the hair remains in a neatly formed pompadour,. 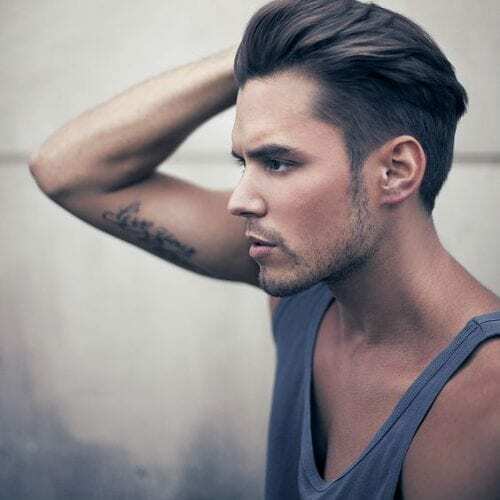 You could even do a loose quiff to make this style work for your hair type. 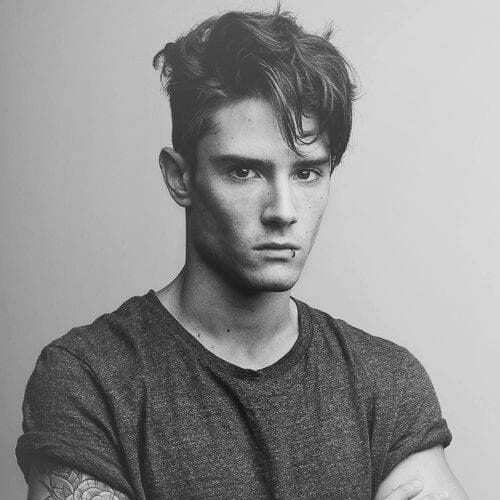 For the gents with long, thick hair up top, a long quiff may suit you best. Brushing back the length with the volume you possess gives it height and makes a statement while also contrasting against the short sides. 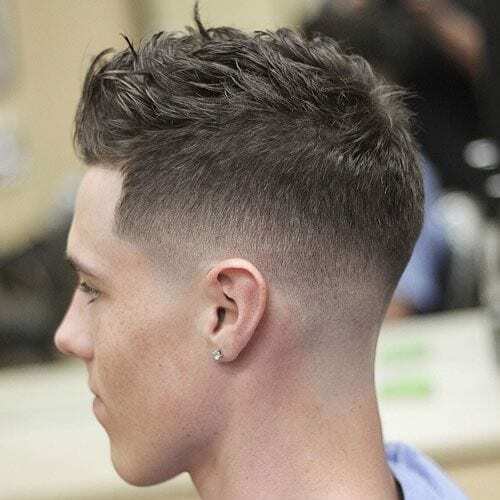 For extra effect, go for a fade or a sharp edge part. 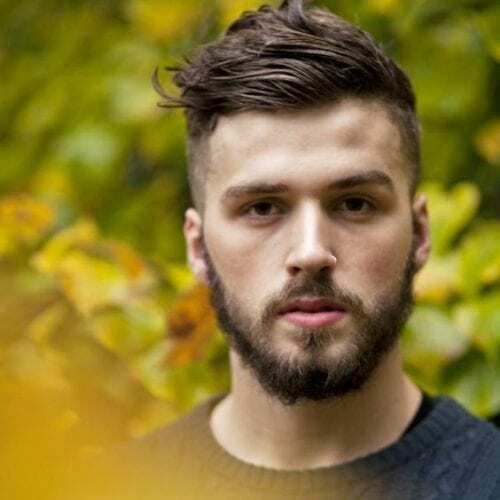 For some guys, the best hairstyles are neatly-cropped and natural-looking. If you’re searching for practical short sides long top hairstyles, you should consider the cleanly-cut look above. We especially recommend it for guys with straight hair. Are you out of ideas for making your hairstyle stand out? You can always count on a temple fade to get the job done. 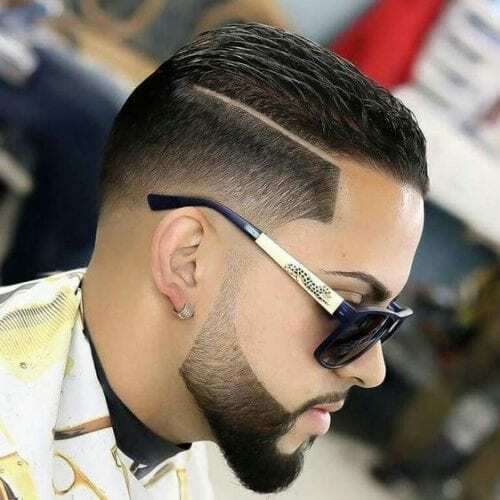 Also known as a box fade, the temple fade shapes your hairline into a rectangular shape. The detail goes a long way for hairstyles with longer tops and shorter sides. Not all of us can pull off a man bun. In fact, not everyone may want to either. 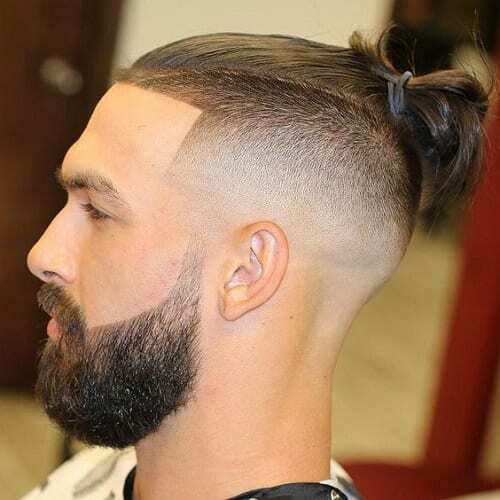 If you want a sleek approach to the rugged man bun, go for a top knot. You can also do additional research on samurai buns for top knot inspiration. You know by now that bangs play a major role in hairstyles with short sides and long tops. But what if you decided to slick yours to the side? The result would be a business casual haircut that’s even fit for a black-tie event. Our final short sides long top haircut is one that involves creativity. 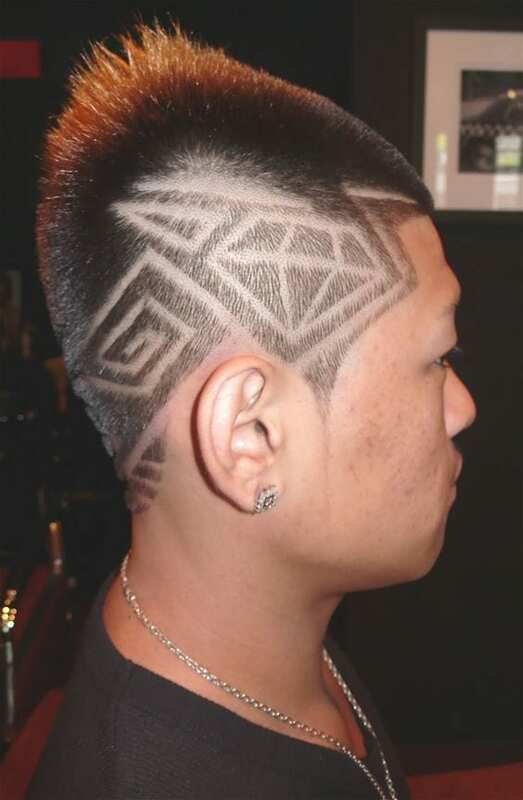 You can add an artsy touch to your appearance by also shaving a V-shape onto the back of your head. In the end, you’ll get a cool hair tattoo that complements your main silhouette. In summary, with so many options available for styling, it’s simple to see why one would go for the catch-all short sides long top haircut. No matter the hair type, texture, or general length, you’ll always have something to do with it, from formal hairstyles to more casual ones. 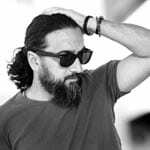 Lastly, all you have to do is decide on the specific length for the top part and start experimenting with hairstyles to make the haircut stand out. Good luck!